Behan Irwin & Gosling are delighted to offer for sale this excellent three bedroom, end of terrace property. There are large private gardens to the rear which are securely gated. To the front there is ample parking available and a large green. All services are easily accessible while Garryvoe Beach is only a few minutes drive away. Cork City is less than a 30 min drive away – making this an ideal purchase for either a first time buyer or for an investor. PVC front door with frosted glass inset leading to hallway with oak laminate wood floor covering, radiator, centre light, 2 power points, 2 phone points. Oak laminate wood floor covering, cast iron solid fuel fireplace with black marble hearth and mahogany surround, radiator, centre light, window with window blinds, TV point, 4 power points. Fully tiled floor, oak fitted kitchen at floor and eye level, fully tiled splash back, stainless steel electric oven with hob and extractor over, plumbed for washing machine and dishwasher, patio sliding door to garden at rear, window, 2 centre lights, 11 power points. WC, WHB, light, expelair, tiled floor, radiator. Fully carpeted, light, 2 power points. Carpet floor covering, radiator, centre light, window, 6 power points, TV point. En Suite – WC, WHB, electric shower with fully tiled walls, floor tiles, light, radiator, expelair. Carpet floor covering, radiator, centre light, window, 4 power points. Carpet floor covering, radiator, light, window, 2 power points. WC, WHB, fully tiled floor, bath with tiled surround, window with frosted glass, radiator, centre light & extractor fan. To the front of the property there is ample parking available with side gate access to rear. To the rear there are gardens laid to lawn with block and pillar and post borders, Barna shed, outside tap and light. Three bedroom end of terrace house in excellent condition throughout. Situated facing a large green with private rear garden. Within walking distance of necessary services including schools, church, service station and pub. 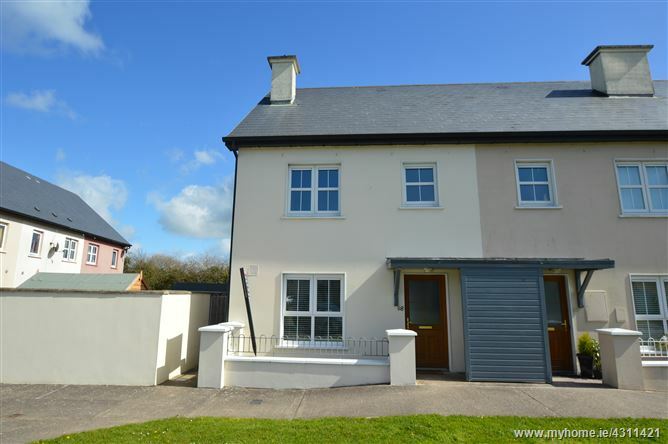 C.5 min drive to Garryvoe Beach and ½ and hour drive to Cork City.